India has recently launched the lead ship of its newest destroyer naming ins Visakhapatnam.Visakhapatnam class destroyer will be the future aegis like destroyer of Indian navy.Visakhapatnam class under the project name p15b in earlier it was rumoured to be named as Bengaluru class but after the launch of the first ship of this class the official name of p15b is identified as Visakhapatnam.There is an order of 4 Visakhapatnam class destroyer was placed to the Mazagon dock limited out of which one ship has been already launched in April 2015. Project 15b will feature an improved mast for its main radar.Vishakhapatnam class will have redesigned superstructure and will have a significant change in a mast.It will have better roll stability and can manoeuvre at high sea and high speed.The displacement of Visakhapatnam class destroyer will be around 7200 tons, almost equal to the Kolkata class ships.The hull of Visakhapatnam class will be same as that of Kolkata class.It can be observed that there is no major redesigning has been done which reduces the cost per destroyer and also the timeline of delivery has been shrunk. 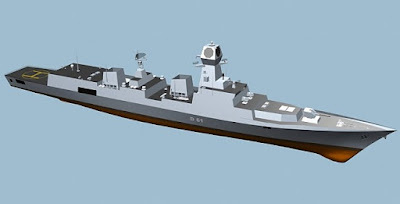 Visakhapatnam class and Kolkata class destroyer both do not use its full space available for weapons, therefore, there is huge opportunity for upgrades in future.Kolkata class has 32 cell for barak8 surface to air missile and 16 cell universal vertical launcher for anti-ship and land attack cruise missile till now it is not specified that the Visakhapatnam class will have same or more weapons as that of the Kolkata class.It may be possible that may have 32 more vertical launchers at the aft of the ship.The Chinese counterpart of the Kolkata class, Type 52D carries 64 universal vertical launchers but has the less space available for the weapon . A question arises when we compare both warships that why Indian warships are lightly armed, answer is Indian ships are definitely going to get a heavy upgrade in their weaponry and may have long-range surface to air missiles developed by DRDO.Kolkata and Visakhapatnam both carries two ASW or multi-role helicopters thus giving an edge in anti-submarine warfare over type52 destroyer of china.It will have a longer range naval gun than Kolkata class, newer will have a 127mm gun whereas Kolkata class has 76mm SRGM. EVENT: 30/9/2015 INS KOCHI commissioned in Mumbai by Manohar Parriakr .